Hundreds accompany Hadas Tapuchi from Ateret on her last journey; suspect death caused by rock attack. 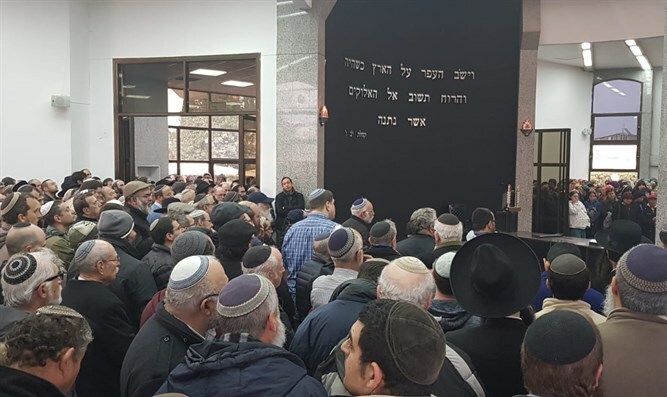 Hadas Tapuchi, a resident of the community Ateret in West Binyamin who was killed yesterday in a road accident on Highway 465 near the village, is being laid to rest in Segula cemetery in Petah Tikva. Darchei Noam woman's seminary former head Rabbi Yosef Yaacobi wrote of Hadas, "Every place where Hadas entered, the atmosphere changed, as if into a Shabbat atmosphere; nobility, willingness to help. Every corner where she put her hand became like a flower. She was always pleasant; I never heard a complaint from her. "Everything was always pleasant and with joy; how can this music stop, it's music that needs to go on; a beautiful flower You plucked, Master of the World," he added. Racheli, a childhood friend of Hadas, said of her, "She was beautiful and stunningly successful. We live in the knowledge that we're going on a journey and there's a danger that we won't return. But I never thought this way about Hadas. Yesterday, after the horror, we met to talk. I was fascinated by the number of people who felt they truly knew Hadas. I was fascinated, but I wasn't surprised. Above all else with her, there was kindness. Hadas is humility, Hadas is simplicity, Hadas is joy. Hadas is a wonderful combination of strength and self-confidence and modesty." Avner, Hadas's brother eulogized: "Our little sister, with the bright eyes, with the rolling laughter. The ways of G-d are hidden; there's a tremendous void in our lives. There was so much righteousness in you, awe of Heaven, modesty, kindness, and pleasantness. We'll make sure to continue your path. Good and straight is the L-rd; the good has gone hiding from our eyes. Hadas, we draw strength from your joy and your goodness." The father, Jacob Langzam, had trouble reading and therefore wrote his eulogy. "Hadas was born in the happiest month of Adar, and she was born to be happy and make others happy. For this, thanks to the Creator. Since the bitter news we ask 'why, why, why'; I don't know if we'll ever know why. G-d gave and G-d took away; may G-d's Name be blessed." Residents of Ateret are calling on security forces to investigate the circumstances that led to Hadas' death, the mother of four who was killed in a truck collision. An IDF tracker identified signs of rocks thrown at cars passing on the road near the village of Umm Tzafa. Ateret residents said rocks are thrown at Israeli vehicles in that location every week, and estimate that the driver tried to dodge the rocks thrown at her, deviated from her lane, and crashed into the oncoming truck.